Sean Saves the Coast Guard… wait, what? On 8:00 AM one Friday morning I got a call from the owner of a company (let’s call him Joe) that works mainly with environmental clean-ups on the east coast. He was looking to rent a filter cart to service 1,500 gallons of lubricating oil on a Coast Guard vessel. Joe wanted to move the lube oil from a holding tank to a certified stainless steel tank. But the oil he was working with had a very high viscosity, so he needed something special. Was I able to provide him with a viable solution? Joe wanted to accomplish two primary goals at the same time: 1. to remove water from the oil and 2. to filter particulate from the oil down to 5 micron. In order to help them out, I proposed our 22-GPM “LCFC” liquid filter cart (PDF), which we had available in our fleet of rental equipment. It’s great for filtering oil of higher viscosities and it’s capable of pumping 500 gallons very quickly. The company needed the filter cart for only a few days, but I offered it to them for a full week just in case they encountered some contingencies. I made sure to also include the appropriate filter elements that would enable them to both remove water and purify the oil. Joe also made a special request for camlock fittings for the end of the hoses so I had our team set up the hoses to accommodate that as well. Fast forward one week later. 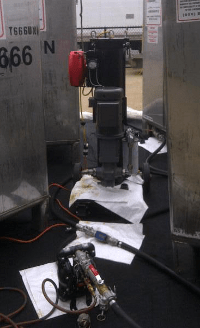 Upon returning the filter cart, Joe provided a couple photos (the one close-up above, and this larger view of the operation) showing his setup of a diaphragm pump that he used to pull oil from tanks up to our filter cart. He said he had about 40 engineers standing around watching what he was doing, so needless to say he felt a lot of pressure while he was getting setup. In the end, he reported back to us that the cart worked wonderfully and they were very happy with the oil quality produced by the filter cart. All of the engineers were also impressed. Yes! Another happy customer.